You can always start your morning with an avocado green smoothie, or a steaming mug of bulletproof coffee, but if you require your breakfast to provide you with long-lasting energy, well into the day, then choose a skillet meal with all the fixings. 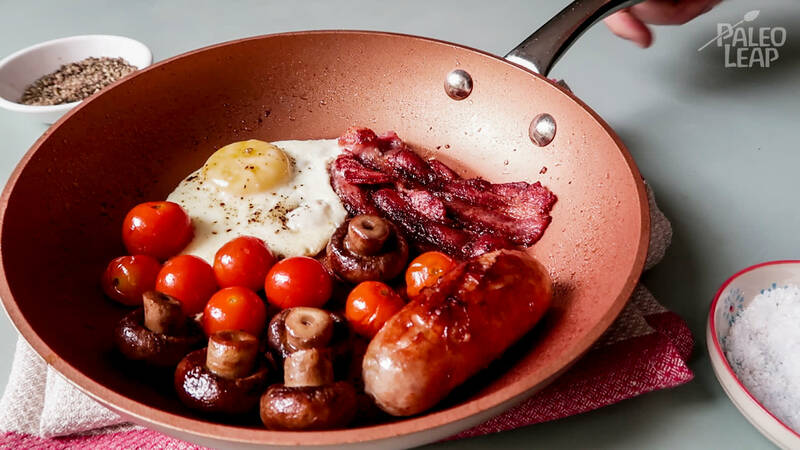 One pan is the perfect size for one person – begin with your favorite gluten-free sausage, then add the mushrooms, the rashers or streaky bacon, cherry tomatoes and finally the egg (or eggs depending on your greediness). Chicken eggs certainly are lovely, don’t forget about duck or quail eggs for added nutritional benefits too. Everyone adores bacon, in fact, the mere thought of it brings the distinct aroma directly to our senses. As Paleo enthusiasts, we know that it can be difficult to find a good tasting bacon without food additives or sugar, yet surely people have been eating bacon long before the addition of sodium nitrates and nitrites?! If you can’t find what you are looking for (ingredient-wise) in the store, try your local butcher or order the best bacon you can find online – and if all else fails, know that homemade bacon is out of this world! It does take some time, but you can get creative with spices, even save a bit of money in the meanwhile. Skillet breakfasts are a terrific start for any day of the week: deliciously bacon- and sausageful, simple to cook, easy to clean up. Melt the coconut oil in a large pan, then add the pork sausage. Cook over medium heat until the sausage is almost cooked through. Add the mushrooms and season with salt. Allow to cook for 2-3 minutes, then add the bacon. Flip the bacon after a minute or two, allowing the bacon fat to render. Add the cherry tomatoes and allow to cook until they start to blister. Finally, moving everything to the edges, add the egg to the pan and cook to your preference.